From the A2 HANNOVER to BERLIN motorway follow the A10 BERLINER RING direction PRENZLAU / HAMBURG. Continue for approx 27kms and take exit 26 (Ausfahrt 26) B5 BERLIN / SPANDAU. Continue for approx 17kms following the signs for CHARLOTTENBURG along the HAMBURGER CHAUSSEE, which then becomes the HEERSTRASSE. The cemetery can be found by turning right onto the parallel HEERSTRASSE road (CWGC sign) and continue for 300m. The site of Berlin 1939-45 War Cemetery was selected by the British Occupation Authorities and Commission officials jointly in 1945, soon after hostilities ceased. Graves were brought to the cemetery from the Berlin area and from eastern Germany. The great majority of those buried here, approximately 80 per cent of the total, were airmen who were lost in the air raids over Berlin and the towns in eastern Germany. The remainder were men who died as prisoners of war, some of them in the forced march into Germany from camps in Poland, in front of the advancing Russians. 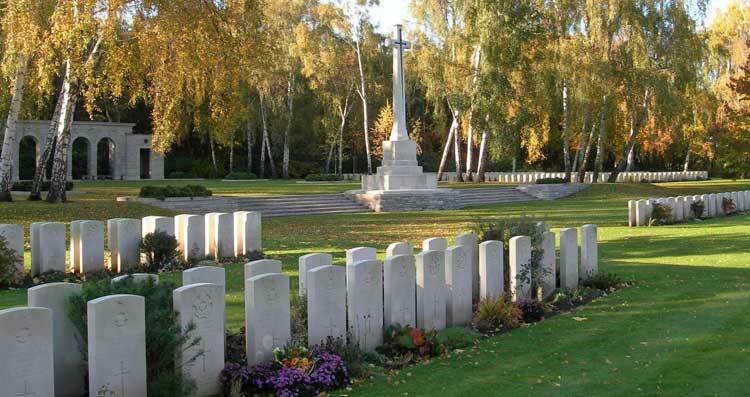 The cemetery contains 3,595 Commonwealth burials of the Second World War, 397 of them unidentified. There are also 6 Non Commonwealth Foreign National burials and in addition there are 265 post war graves of men of the British Occupation Forces or their dependants, or of members of the Control Commission.